Do you have sudden food cravings? I am sure you do, even if you’re not pregnant. 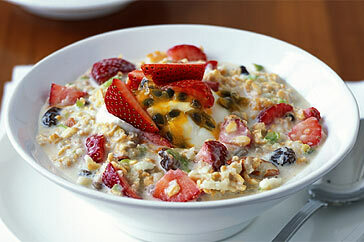 Today, even though it’s way before dawn, I feel like Birchermuesli. Perhaps it was because I fasted from all grains yesterday in observance of the holy Ekadasi day. Or it could have something to do with the fact that I published the recipe on my Recipe of the Week over the weekend. Somehow thoughts of it got lodged in my memory hard drive and have now reappeared, demanding gratification. Desires are like that. Well it’s too bad, Kurma. You didn’t soak your rolled oats last night. In fact I don’t have any. Only steel-cut, which are way too serious for eating raw. Birchermuesli is named after its creator, Dr. Bircher Benner, who was ousted from the Swiss medical profession in 1900 for his heretical claims that grains, nuts, fruits and vegetables had more nutritional value than did meats. Wash your mouth out, Doctor!! In formulating the muesli, Benner had in mind his many patients from wealthy families who were suffering the effects of a diet too high in protein. Although it was not originally intended as a breakfast food, it certainly fills that niche deliciously. Here’s the recipe. It serves 4 very modest eaters. I could eat the whole thing on a big day. fresh seasonal berries like raspberries, strawberries or blueberries, to taste. Place the soaked oats and whatever residual water remains with them in a large bowl along with the lemon juice. Grate the un-peeled apples, and mix them into the oats and lemon to avoid discolouration. Add the nuts, yogurt and honey and combine. Carefully fold in the sliced or chopped fruit. Serve: transfer to serving bowls and decorate with berries. Note: the muesli will keep for 24 hours in the refrigerator. The apple might discolour but this should not affect the taste.